Sept. 19, 2010, marks the 30th Terry Fox Run. The annual event has raised more than $550 million for cancer research. Terry Fox, on his Marathon of Hope run across Canada, days before he had to end it in September 1980. ((Canadian Press))Terry Fox was "a very ordinary young man," according to his mother, Betty Fox. But the ordinary young man became a national hero when he embarked on his Marathon of Hope — a cross-country run to raise money for cancer research. His goal was to persuade every Canadian to donate one dollar for cancer research. Fox cut short his run when the cancer he thought he had fought off three years earlier returned. 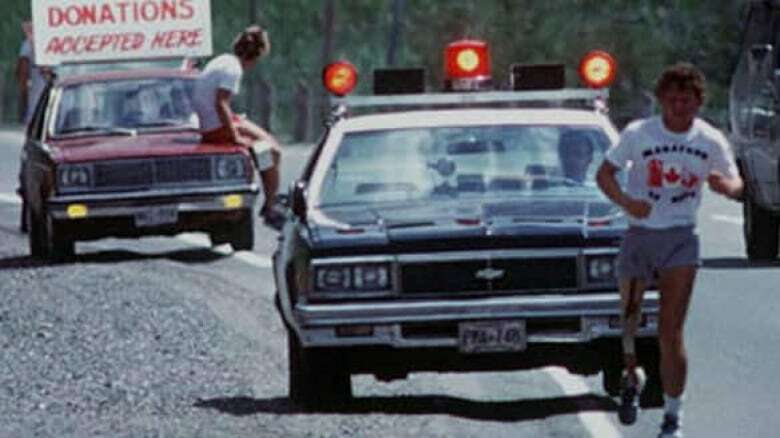 While the dream to run across the country died, Fox's dream to raise money and awareness thrived with the birth of the annual Terry Fox Run. Terry Fox was born in 1958 in Winnipeg. A few years, later his family moved to Port Coquitlam, B.C. As a kid, he was always enthusiastic about sports, even when he was the worst player on his Grade 8 basketball team. A teacher encouraged him to go out for cross-country running, a sport in which he had little interest. But Fox was determined to be better and please his coach. In his final year at Port Coquitlam secondary school, he shared the athlete of the year award with his friend, Doug Alward. After that, he went on to study physical education at Simon Fraser University. In 1977, when a pain in Terry's knee got so bad he could barely stand, he went to the hospital, where he was diagnosed as having osteogenic sarcoma, a form of bone cancer. His right leg was amputated about six inches above his knee. He hated the time he spent in hospital and pushed himself to learn to walk again. His determination had him out playing golf only six weeks after the operation. Later, basketball returned to his life when he was invited to play wheelchair basketball with Rick Hansen. But Terry never forgot his experience in the hospital. He was angry at how little money was spent on cancer research in Canada. He turned his anger into a mission — he would launch a run across the country to raise both awareness and money in his fight against cancer. Terry Fox, shown during his run across Canada to raise money for cancer research in 1980, had to stop his journey just west of Thunder Bay, Ont., when his cancer returned and spread to his lungs. (Canadian Press)When he began training, he kept his dream a secret. He told his family he was training for the Vancouver Marathon. The beginning was tough. He spent most of his time falling down and picking himself off the floor. He kept going, though, and after more than a year, and over 4,800 kilometres of running, he announced his plans to his family. 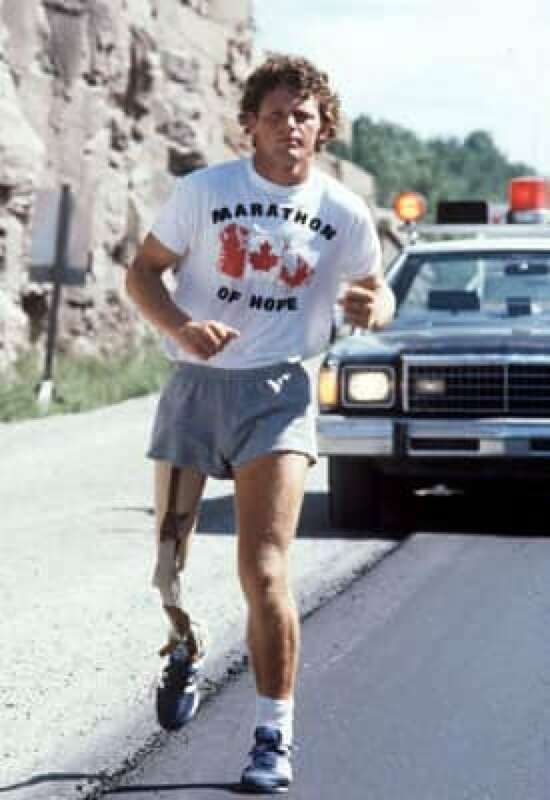 On April 12, 1980, Terry Fox dipped his artificial foot in the Atlantic Ocean off St. John's and began his Marathon of Hope. He ran about 42 kilometres each day no matter the weather — freezing rain, high winds, even snow. Skeptics thought he would never make it past New Brunswick, but he proved them wrong and Terry Fox became a household name. He passed through Sudbury, Ont., in August, the halfway point on his journey west. But on Sept. 1, chest pains and breathing problems forced him to stop running. He was just past Thunder Bay. After 143 days and 5,373 kilometres, he announced he would have to postpone the rest of the run, saying, "I'm gonna do my very best. I'll fight, I promise I won't give up." Fox was sent to a hospital in B.C., where doctors discovered the source of his chest pains: cancer had spread to his lungs. While the Marathon of Hope was stalled, donations kept coming. A total of $24.17 million was raised, surpassing Fox's initial goal. While he was in hospital, he received a letter from one of the many people he had inspired along the way. Isadore Sharp, president of the Four Seasons Hotel, wrote Fox offering to help him continue his dream through an annual fundraiser. It would be called the Terry Fox Run. Fox agreed, but insisted on some ground rules: The event would be non-competitive — no winners, no awards, just the goal of raising money for cancer research. And there would be no corporate sponsorship. Fox died on June 28, 1981, but not before becoming the youngest person ever to be awarded the Order of Canada. Two-and-a-half months after his death, the first Terry Fox Run was held on Sept. 13, 1981. More than 300,000 Canadians took part in the event at 760 sites across the country. The run raised $3.5 million. On Sept. 19, 2010, the 30th annual Terry Fox Run will be held. So far, the event has raised $553 million for cancer research. And it has gone global. In 2008 alone, more than two million people in 28 countries took part in Terry Fox runs. Those locations included Afghanistan, Viet Nam, Saudi Arabia, Oman, Malaysia, France, Belgium and the United States. Advances in imaging technology used worldwide. Increased life expectancy for men with advanced stage prostate cancer. The discovery of a new mutation that may lead to new treatments for lymphoma. Advances in early screening techniques that could potentially improve survival rates from lung cancer.